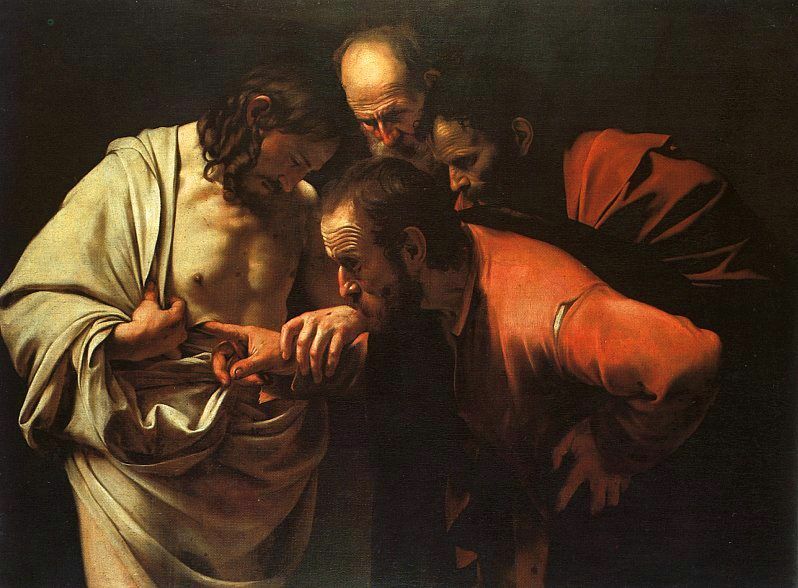 THOMAS THE APOSTLE, also called Doubting Thomas or Didymus (meaning “Twin“) was one of the Twelve Apostles of Jesus. He is best known for questioning Jesus’ resurrection when first told of it, then proclaiming “My Lord and my God” on seeing Jesus in John 20:28. He was perhaps the only Apostle who went outside the Roman Empire to preach the Gospel. He is also believed to have crossed the largest area, which includes the Parthian Empire and India. The Eastern Orthodox and Byzantine Catholic churches celebrate his feast day on October 6 (for those churches which follow the traditionalJulian Calendar, October 6 currently falls on October 19 of the modern Gregorian Calendar). In addition the next Sunday of the Easter (Pascha) is celebrated as Sunday of Thomas, in commemoration of Thomas’ question to Jesus which led him to proclaim, according to Orthodox teaching, two natures of Jesus, both human and divine. Thomas is also commemorated in common with all of the other apostles on June 30 (July 13), in a feast called the Synaxis of the Holy Apostles. He is also associated with the “Arabian” (or “Arapet”) icon of the Theotokos(Mother of God), which is commemorated on September 6 (September 19). St. Thomas receiving the Virgin Mary’s girdle from heaven. 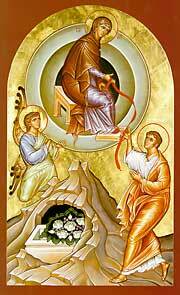 According to The Passing of Mary, a text attributed to Joseph of Arimathaea, Thomas was the only witness of the Assumption of Mary into heaven. The other apostles were miraculously transported to Jerusalem to witness her death. Thomas was left in India, but after her first burial he was transported to her tomb, where he witnessed her bodily assumption into heaven, from which she dropped her girdle. In an inversion of the story of Thomas’ doubts, the other apostles are skeptical of Thomas’ story until they see the empty tomb and the girdle. Thomas’ receipt of the girdle is commonly depicted in medieval and pre-Tridentine Renaissance art. St. Thomas is traditionally believed to have sailed to India in 52AD to spread the Christian faith among the Jews, the Jewish diaspora present in Kerala at the time.He is supposed to have landed at the ancient port of Muziris (which became extinct in 1341 AD due to a massive flood which realigned the coasts) near Kodungalloor. He then went to Palayoor (near present-day Guruvayoor), which was a Hindu priestly community at that time. He left Palayoor in AD 52 for the southern part of what is now Kerala State, where he established theEzharappallikal, or “Seven and Half Churches”. These churches are at Kodungallur, Kollam, Niranam (Niranam St.Marys Orthodox Church, Nilackal (Chayal), Kokkamangalam, Kottakkayal (Paravoor), Palayoor (Chattukulangara) and Thiruvithancode Arappally – the half church. …Into what land shall I fly from the just? There went I, and there was he: here and there to my grief I find him. —quoted in Medlycott 1905, ch. ii. St. Ephraem, the great doctor of the Syrian Church, writes in the forty-second of his “Carmina Nisibina” that the Apostle was put to death inIndia, and that his remains were subsequently buried in Edessa, brought there by an unnamed merchant. A Syrian ecclesiastical calendar of an early date confirms the above and gives the merchant a name. The entry reads: “3 July, St. Thomas who was pierced with a lance in India. His body is at Urhai [the ancient name of Edessa] having been brought there by the merchant Khabin. A great festival.” It is only natural to expect that we should receive from Edessa first-hand evidence of the removal of the relics to that city; and we are not disappointed, for St. Ephraem, the great doctor of the Syrian Church, has left us ample details in his writings. A long public tradition in the church at Edessa honoring Thomas as the Apostle of India resulted in several surviving hymns that are attributed to Ephrem, copied in codices of the 8th and 9th centuries. References in the hymns preserve the tradition that Thomas’ bones were brought from India to Edessa by a merchant, and that the relics worked miracles both in India and at Edessa. A pontiff assigned his feast day and a king and a queen erected his shrine. The Thomas traditions became embodied in Syriac liturgy, thus they were universally credited by the Christian community there. There is also a legend that Thomas had met the Biblical Magi on his way to India. According to Eusebius’ record, Thomas and Bartholomew were assigned to Parthia and India. The Didascalia (dating from the end of the 3rd century) states, “India and all countries condering it, even to the farthest seas…received the apostolic ordinances from Judas Thomas, who was a guide and ruler in the church which he built.”Moreover, there is a wealth of confirmatory information in the Syriac writings, liturgical books, and calendars of the Church of the East, not to mention the writings of the Fathers, the calendars, the sacramentaries, and the martyrologies of the Roman, Greek and Ethiopian churches. Since trade routes from the East were wide open at the time and were used by early missionaries, there are no circumstantial reasons why Thomas could not have visited India in the 1st century. And his visit is the most plausible explanation for the early appearance of the church there. An early 3rd-century Syriac work known as the Acts of Thomas connects the apostle’s Indian ministry with two kings, one in the north and the other in the south. According to one of the legends in the Acts, Thomas was at first reluctant to accept this mission, but the Lord appeared to him in a night vision and said, “Fear not, Thomas. Go away to India and proclaim the Word, for my grace shall be with you. ”But the Apostle still demurred, so the Lord overruled the stubborn disciple by ordering circumstances so compelling that he was forced to accompany an Indian merchant, Abbanes, to his native place in northwest India, where he found himself in the service of the Indo-Parthian king, Gondophares. According to the Acts of Thomas, the apostle’s ministry resulted in many conversions throughout the kingdom, including the king and his brother. Critical historians treated this legend as an idle tale and denied the historicity of King Gundaphorus until modern archeology established him as an important figure in North India in the latter half of the 1st century. Many coins of his reign have turned up in Afghanistan, the Punjab, and the Indus Valley. Remains of some of his buildings, influenced by Greek architecture, indicate that he was a great builder. Interestingly enough, according to the legend, Thomas was a skilled carpenter and was bidden to build a palace for the king. However, the Apostle decided to teach the king a lesson by devoting the royal grant to acts of charity and thereby laying up treasure for the heavenly abode. Although little is known of the immediate growth of the church, Bar-Daisan (154–223) reports that in his time there were Christian tribes in North India which claimed to have been converted by Thomas and to have books and relics to prove it. But at least by the year of the establishment of the Second Persian Empire (226), there were bishops of the Church of the East in northwest India, Afghanistan and Baluchistan, with laymen and clergy alike engaging in missionary activity. The Acts of Thomas identifies his second mission in India with a kingdom ruled by King Mahadwa, one of the rulers of a 1st-century dynasty in southern India. It is most significant that, aside from a small remnant of the Church of the East in Kurdistan, the only other church to maintain a distinctive identity is the Mar Thoma or “Church of Thomas” congregations along the Malabar Coast of Kerala State in southwest India. According to the most ancient tradition of this church, Thomas evangelized this area and then crossed to the Coromandel Coast of southeast India, where, after carrying out a second mission, he died near Madras. Throughout the period under review, the church in India was under the jurisdiction of Edessa, which was then under the Mesopotamian patriarchate at Seleucia-Ctesiphon and later at Baghdad and Mosul. Historian Vincent A. Smith says, “It must be admitted that a personal visit of the Apostle Thomas to South India was easily feasible in the traditional belief that he came by way of Socotra, where an ancient Christian settlement undoubtedly existed. I am now satisfied that the Christian church of South India is extremely ancient… ”. Piecing together the various traditions, one may conclude that Thomas left northwest India when invasion threatened and traveled by vessel to the Malabar coast, possibly visiting southeast Arabia and Socotra enroute and landing at the former flourishing port of Muziris on an island near Cochin (c. AD. 51–52). From there he is said to have preached the gospel throughout the Malabar coast, though the various churches he founded were located mainly on thePeriyar River and its tributaries and along the coast, where there were Jewish colonies. He reputedly preached to all classes of people and had about seventeen thousand converts, including members of the four principal castes. Later, stone crosses were erected at the places where churches were founded, and they became pilgrimage centres. In accordance with apostolic custom, Thomas ordained teachers and leaders or elders, who were reported to be the earliest ministry of the Malabar church. According to legend, St. Thomas attained martyrdom at St. Thomas Mount in Chennai and is buried on the site of San Thome Cathedral. After a short stay in the Greek island of Chios, on September 6, 1258, the relics were transported to the West, and now rest in Ortona, Italy. Coin of Gondophares IV Sases (mid-1st century). Rev: Zeus, making a benediction sign (Buddhist mudra).Kharoshthi inscription MAHARAJASA MAHATASA TRATARASA DEVAVRADASA GUDAPHARASA SASASA “Great king of kings, divine and saviour, Gondophares Sases”, Buddhist trisula symbol. Southern India had maritime trade with the West since ancient times. Egyptian trade with India and Roman trade with Indiaflourished in the 1st century AD. In AD 47, the Hippalus wind was discovered and this led to direct voyage from Aden to the South Western coast in 40 days. Muziris (Kodungallur) and Nelcyndis or Nelkanda (near Kollam) in South India, are mentioned as flourishing ports, in the writings of Pliny the Elder (AD 23–79). Pliny has given an accurate description of the route to India, the country of Cerebothra (the Cheras). Pliny has referred to the flourishing trade in spices, pearls, diamonds and silk between Rome and Southern India in the early centuries of the Christian era. Though the Cheras controlled Kodungallur port, Southern India belonged to the Pandyan Kingdom, that had sent embassies to the court of Augustus Caesar. According to Indian Christian tradition, St. Thomas landed in Kodungallur in AD 52, in the company of a Jewish merchant Abbanes (Hebban). There were Jewish colonies in Kodungallur since ancient times and Jews continue to reside in Kerala till today, tracing their ancient history. According to tradition, at the beginning of the 3rd century, the body of Thomas appeared in Edessa, Mesopotamia, where they had been brought by a merchant coming from India (in that same period appeared the Acts of Thomas). They were kept in a shrine just outside the city, but, in August 394, they were transferred in the city, inside the church dedicated to the saint. In 441, the Magister militum per Orientem Anatolius donated to the church a silver coffin to host the relics. In 1144 the city was conquered by the Zengids and the shrine destroyed. There is a copper plate grant given to Iravi Korttan, a Christian of Kodungallur (Cranganore), by King Vira Raghava. The date is estimated to be around AD 744. In AD 822, two NestorianPersian Bishops Mar Sapor and Mar Peroz came to Malabar, to occupy their seats in Kollam and Kodungallur, to look after the local Syrian Christians (also known as St. Thomas Christians). Shrine of Saint Thomas in Meliapore, 18th century print. Marco Polo, the Venetian traveller and author of Description of the World, popularly known as Il Milione, is reputed to have visited South India in 1288 and 1292. The first date has been rejected as he was in China at the time, but the second date is accepted by many historians. He is believed to have stopped in Ceylon (Sri Lanka) where he documented the tomb of Adam, and Quilon (Kollam) on the western Malabar coast of India, where he met Syrian Christians and recorded their legends of St. Thomas and his miraculous tomb on the eastern Coromandel coast of the country. Il Milione, the book he dictated on his return to Europe, was on its publication condemned as a collection of impious and improbable traveller’s tales but it became very popular reading in medieval Europe and inspired Spanish and Portuguese sailors to seek out the fabulous, and possibly Christian, India described in it. Near Chennai (formerly Madras) in India stands a small hillock called St. Thomas Mount, where the Apostle is said to have been killed in AD 72 (exact year not established). Also to be found in Chennai is the Dioceses of Saint Thomas of Mylapore to which his mortal remains were supposedly transferred. The Indian tradition, in which elements of the traditions of Malabar, Coromandel and the Persian Church intermingled firmly held that Thomas the Apostle died near the ancient town of Mylapore. His mortal remains were apparently buried in the town and his burial place was situated in the right hand chapel of the church or house known after his name. No archaeological evidence support these claims though, while Ishwar Sharan rebuts them in his The Myth of Saint Thomas and the Mylapore Shiva Temple. Information copied from WIkipedia ,the free Encyclopedia.